Steel pipe construction, pipelines and ship building in the North and Baltic Seas present the highest demands on material and weld seams. For these extreme demands of the wind, energy, oil and ship building industries, we stock HF and UP longitudinal welded as well as seamless steel pipe from reputed manufacturers. We stock and supply longitudinal and spirally welded steel pipes for many different areas of application and segments in standard or commercially available lengths according to your requirements. The advantage of steel tubes for precision applications is the high precision of their manufacturing, the good quality of their surface, and the guaranteed mechanical and technological properties. That is why the pipes are widely used in the machining industry and in the automotive industry. 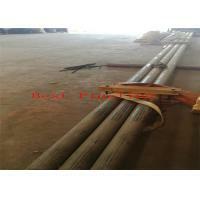 Welded pipes for precision applications are manufactured in the process of cold drawing. Double-submerged arc welded (DSAW) large diameter straight seam and spiral pipe for oil and gas transmission is available with external fusion bonded epoxy and abrasion-resistant overlay coatings, as well as internal epoxy coating.